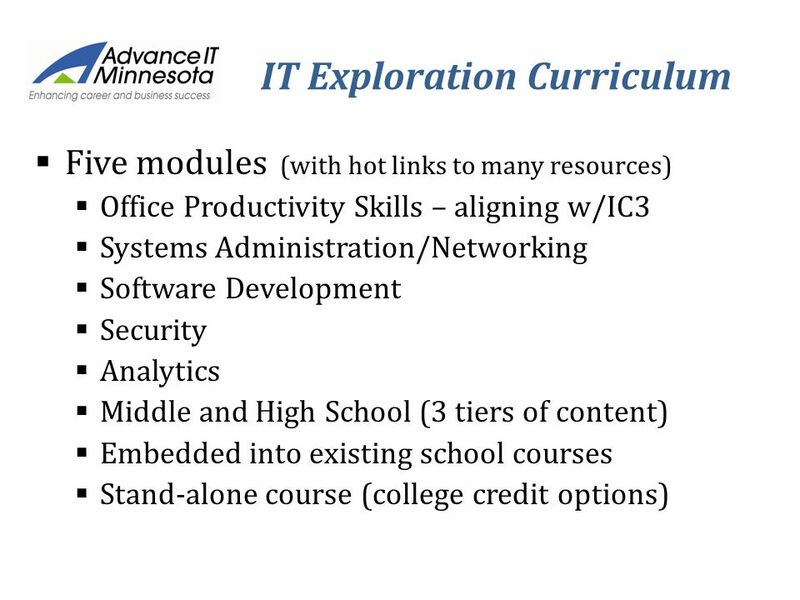 3 Overview of IT Exploration  What is IT Exploration about?  Who is the intended audience?  Why does IT Exploration matter to students, parents, school staff?  How does it fit into existing programs and activities?  How does it align to IC3 certifications and MnSCU college credit? 8 How to get started… Simple and easy as 1, 2, 3! 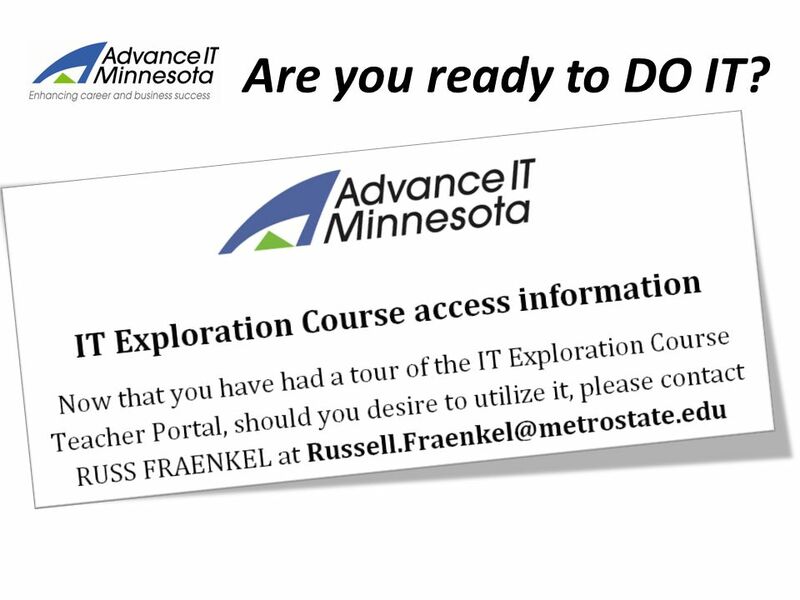 1.Contact Russ Fraenkel at Advance IT Minnesota to discuss your interests, and training options (Next Training will be Thurs. 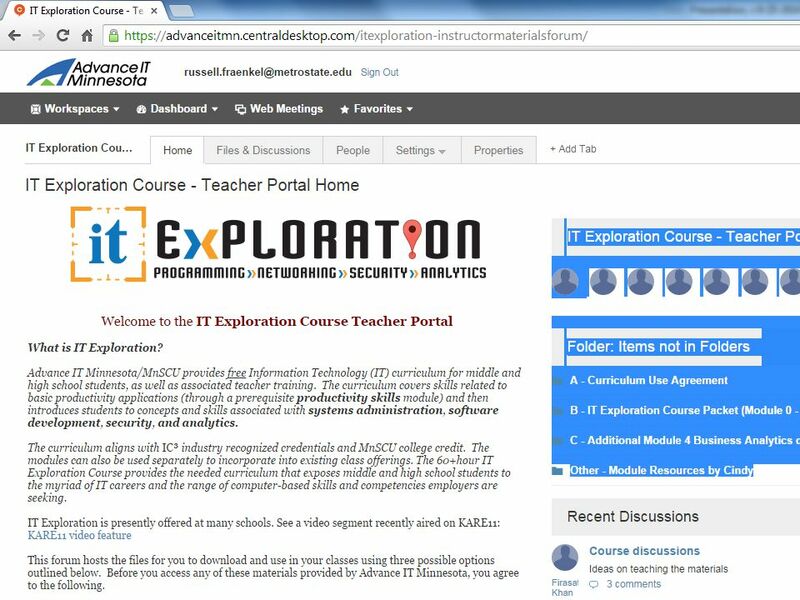 Dec. 4, 2014 – 9am-5pm, or as determined by local demand) 2.Execute IT Exploration Curriculum Use agreement  Controlled dissemination of materials  Satisfaction survey of teachers and students 3.Download materials, host on school online platform (e.g. Moodle), or on shared network, and deliver! 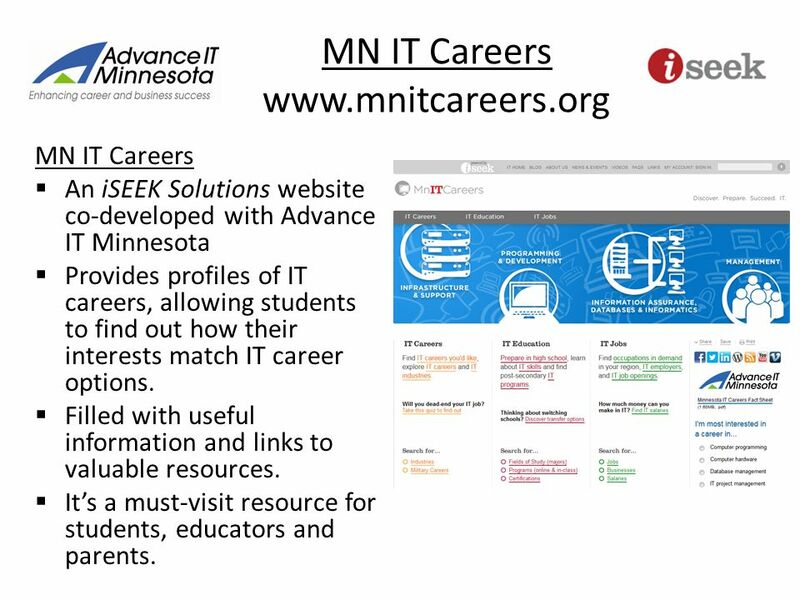 12 MN IT Careers www.mnitcareers.org MN IT Careers  An iSEEK Solutions website co-developed with Advance IT Minnesota  Provides profiles of IT careers, allowing students to find out how their interests match IT career options.  Filled with useful information and links to valuable resources. 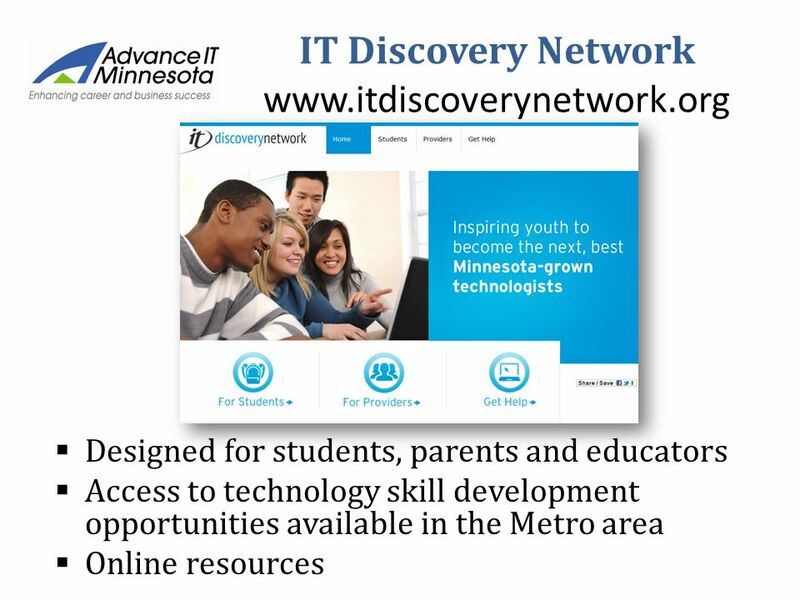  It’s a must-visit resource for students, educators and parents. 13 Are you ready to DO IT? 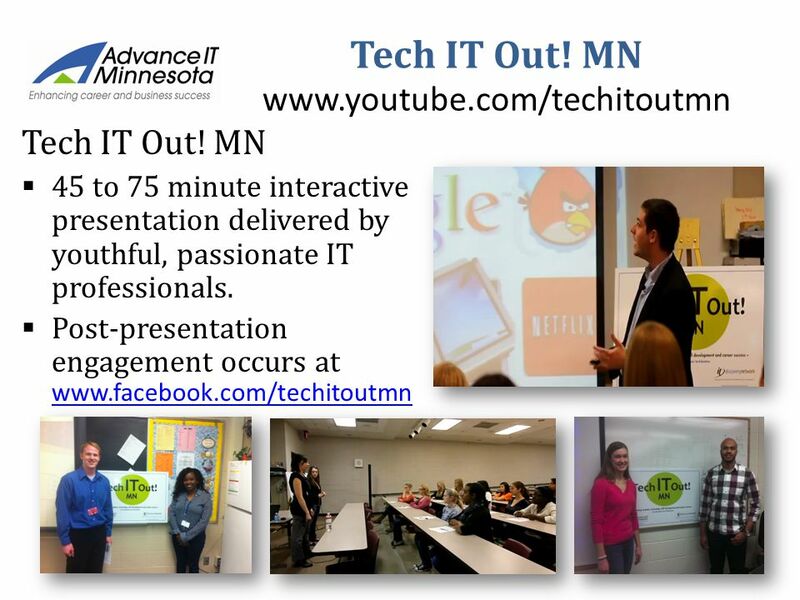 Download ppt "IT is it! 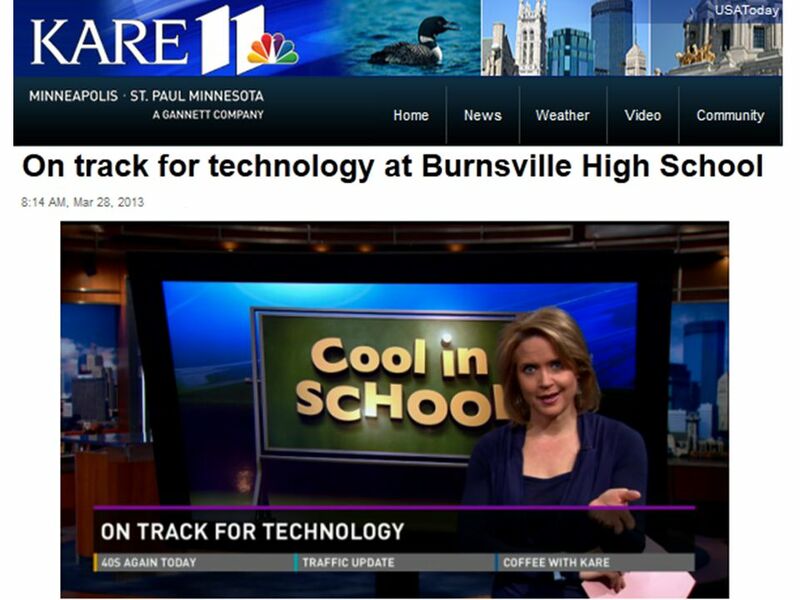 Overview of IT Exploration Curriculum Presenters Cindy Drahos (High School Teacher, Burnsville High School) Firasat Khan (Director of Academic." GEAR UP Transition Framework and Planning Guide GEAR UP Alliance 2009 Institute for a College-Going Culture Sherri Beshears-McNeely. Goals: Increase Awareness Support Teachers and other staff Goals: Increase Awareness Support Teachers. Introducing Computing At School An Overview Lee Willis Level 1 Master Teacher Computing At School. C3 Goals Students will: 1.acquire teamwork competencies 2.acquire knowledge, values and beliefs of health professions different from their own profession. 1003(a) AdvancED Project (a) Tier IV. ABSTRACT The long-term goal of the Partnership for Environmental Education and Rural Health ( is to develop and disseminate an engaging. Transforming Education in Kentucky EPSB and TEK 1. Overarching Goal: To strengthen the college- and career- going culture across the four Diplomás independent school districts in San Antonio so that a. National Council for Workforce Education Casting Relationships, Forging Partnerships 2014 Conference Retooling Atlanta Metropolitan State College Adult. Student InterventionsImplementation NeedsCommunication Strategy Counselor / Teachers Career Development (K-12) Traveling Career Portfolio with attached. Cypress-Fairbanks ISD Dr. Marie Keith, Director – College & Career Readiness AUGUST 2010.